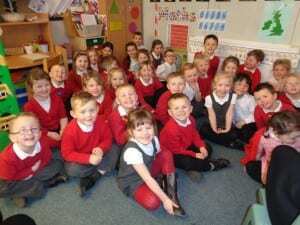 Reception celebrated the Queen’s birthday in style. They made crowns, decorated cakes and enjoyed having a tea party while watching the live celebrations at Windsor Castle. We had a fantastic day at the Farm. First we had a look at some of the little animals. We saw some rabbits with their babies, they were only 1 week old. We held the rabbits and the chicks, there were so many to choose from! We were very careful holding the fluffy chicks, they were only 10 days old. After that it was time to go and feed some of the young lambs, we held on tightly to the bottles and loved seeing the tails wiggle as they fed. Next we met Summer the donkey, she enjoyed letting us brush her coat, it was very soft. After lunch it was time to meet George the pig. He was waiting for his wash. It was time for a tractor ride where we saw the racoons, highland cows and a bull, he was huge! After the tractor ride we had fun in the play area before it was time to get the bus back to school. After waiting 21 days, finally our eggs have hatched. The children were very excited watching the eggs hatch into chicks. They watched carefully as the chicks used their beaks to peck a whole in the egg and finally pop their heads through the shell and hatch. In reception we have been building some fantastic dens in our forest area. In groups the children worked together to build their dens. They used natural materials from the forest, as well as our school den building kit to design and build dens. They worked together as a team using problem-solving, decision-making and communication skills.